AJA CION is the new 4K/UHD and 2K/HD production Camera from AJA. Record directly to Apple ProRes 422 and 444 at upto 4K 60fps or output AJA Raw upto 4K 120fps. CION features an ergonomic design and open connectivity to give complete flexibility in the field or studio. AJA CION represents a new direction for AJA but one that is firmly rooted in everything that has been learned over the last 21 years. 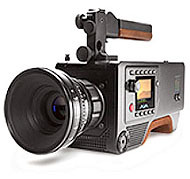 A considered process has been used to create a true production camera with a feature set and form factor that offers the user a wide variety of options both in the field and the studio. The design of the camera allows complete flexibility for the user to adapt to any environment. AJA CION is a union of great design and functionality, an engineered aesthetic that AJA is proud to describe as the Science of the Beautiful. AJA CION features a 4K APS-C sized CMOS sensor with an electronic global shutter and 12 stops of dynamic range. Lenses designed for Super 35mm cover the sensor imaging area and the global shutter eliminates the undesirable qualities associated with rolling shutter-based sensors. AJA CION can record at 4K (4096x2160), UltraHD (3840x2160), 2K (2048x1080) and HD (1920x1080). 2K and HD are hardware scaled from the full 4K sensor, resulting in beautiful over-sampled images, which also retain your lens’ focal length at any desired resolution. Frame rates up to 50 and 60p are supported - even at full 4K resolution. CION uses AJA’s proven SSD-based Pak storage. The robust high speed compact storage mounts directly in-camera and allows recording of 4K/UHD and 2K/HD as ProRes 4444, ProRes 422 (HQ), ProRes 422, ProRes 422 (LT) and ProRes (Proxy). Choose from generous 256GB or 512GB capacities and by utilizing the AJA Pak Dock (sold separately) you can transfer your footage over high-speed Thunderbolt™or USB3. AJA CION is also fully capable of outputting frame rates up to 120 fps as either 4K or UHD from its 4 x 3G-SDI outputs as AJA Raw. AJA’s Corvid Ultra in conjunction with TruZoom™ software can take the AJA Raw output and replay it at up to 60 fps. Output up to 30fps AJA Raw via the Thunderbolt™ connector. CION can also record HFR 4K 50 and 60p to Pak media, as Apple ProRes 422. The integrated confidence monitor not only displays the menu information but also previews your real-time image, allowing independent operation. AJA CION also offers powerful network-based control. Via the LAN connection, a web-browser UI allows for remote configuration of the camera. Your CION is completely controllable whether it’s on a crane, jib or car mount from virtually any web browser. AJA CION’s considered design brings ease of operation to both field and studio based productions. For single users, set up and operation is intuitive and straightforward. For more complex productions camera operators, camera assistants and digital imaging technicians may all interact with CION without conflict. In such a scenario, the camera operator can use one monitor output for framing, the camera assistant another monitor output for judging focus and the digital imaging technician can use yet another monitor output as well as the web UI to configure the unit.